In order to create a more certain future for the people, communities and wildlife of Louisiana, sediment must be treated like the precious resource it is, and as much of it as possible must be used for coastal restoration efforts. The Mississippi River has never carried enough sediment to sustain the entirety of Louisiana’s deltaic coastline at any one time . Instead, while sediment delivered by the river and its distributaries was building a delta lobe in one part of the coast, coastal processes, such as subsidence and erosion, caused land loss and reshaping of the older abandoned delta lobes. As a result of this ongoing deltaic cycle, over the last 7,500 years, while 40 percent (at most) of the coast was growing at any given time, 60 percent of the coast was retreating. Today, with flood protection levees holding the river in place and cutting it off from nearby wetlands, it’s estimated that less than 10 to 15 percent of Louisiana’s deltaic coast is currently maintained by the river[3,4]. Up and down the river, levees have limited the number and location of outlets for sediment-laden water to enter into shallow water area where land can easily build. Additionally, the total amount of sediment carried by the Mississippi and Atchafalaya Rivers has been reduced from 400 million tons per year to about 200 million tons per year[5,6]. This reduction in the amount of sediment carried by the river is the result of changes in land management practices that have reduced sediment runoff from the drainage basin and the trapping of sediment behind dams and locks constructed along the Mississippi and its tributaries, particularly the Missouri River. The reduction of the amount of sediment carried by the river is significant and creates challenges for coastal restoration. Nonetheless, the Mississippi River is still one of the largest rivers in the world, and the amount of sediment it carries is substantial. 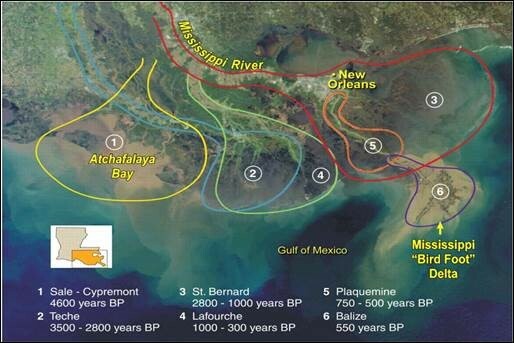 However, even the natural processes that once built the Mississippi River Delta didn’t capture all of the sediment carried by the river[1,7]. Before the sediment supply was reduced and the river was pinned in place, between 30 to 70 percent of the sediment from the river was retained to build the landscape of the delta. The rest of the sediment was transported to the deeper waters of the Gulf. Given the river’s reduced sediment load, we would need to capture and retain 60 percent of the sediment currently in the river order to match the lower end (30 percent) of the historical sediment supply that built the delta landscape. Design sediment diversions to carry large sediment loads, and locate and operate them to retain as much sediment as possible in areas where it can be protected from being erosion and washing out into the Gulf[2, 10]. Learn more about how many tons of sediment go uncaptured by visiting our wasted sediment page. This is part 2 of our ongoing series where our experts will answer 10 fundamental questions with new and updated information, so that reasonable and scientifically-sound decisions can be made about the long-term sustainability of the delta and surrounding ecosystems. View an introduction to this series. Bentley, S.J., A.M. Freeman, C.S. Willson, J.E. Cable and L. Giosan. 2014. Using what we have: Optimizing sediment management in Mississippi River Delta Restoration to improve the economic viability of the nation. In J.W. Day, G. Kemp, A.M. Freeman, and D.P. Muth (eds. ), Perspectives on the Restoration of the Mississippi Delta: The Once and Future Delta, Springer (85-97). Blum, M.D. and H.H. Roberts. 2012. The Mississippi River Delta Region: past present and future. Annual Review of Earth and Planetary Sciences 40: 655-683. Day, J.W., D.F. Boesch, E.J. Clairain, G.P. Kemp, S.B. Laska W.J. Mitsch, K. Orth, H. Mashriqui, D.J. Reed, L. Shabman, C.A Simenstad, B.J. Streever, R.R. Twilley, C.C. Watson, J.T. Wells, D.F. Whigham. 2007. Restoration of the Mississippi Delta: lessons learned from Hurricanes Katrina and Rita. Science 315: 1679-1684. Meade, R.H. and J.A. Moody. 2010. Causes for the decline of suspended-sediment discharge in the Mississippi River system, 1940-2007. Hydrological Processes 24:35-49. Allison, M.A., C.R. Demas, B.A. Ebersole, B.A. Kleiss, C.D. Little, E.A. Meselhe, N.J. Powell, T.C. Pratt and B.M. Vosburg. 2012. A water and sediment budget for the lower Mississippi-Atchafalaya River in flood years 2008-2010: Implication for sediment discharge to the oceans and coastal restoration in Louisiana. Journal of Hydrology 432: 84-97. Paola, C. R.R. Twilley, D.A. Edmonds, W. Kim, D. Mohrig, G. Parker, E. Viparelli, and V.R. Voller. 2011. Natural processes in Delta Restoration: Application to the Mississippi Delta. Annual Review of Marine Science 3: 67-91. Kemp, G.P., J.W. Day, J.D. Rogers, L. Giosan, and N. Peyronnin. 2016. Enhancing mud supply from the Lower Missouri River to the Mississippi River Delta USA: Dam bypassing and coastal restoration. Estuarine, Coastal and Shelf Science 183: 304-313. Blum, M.D. and H.H. Roberts. 2009. 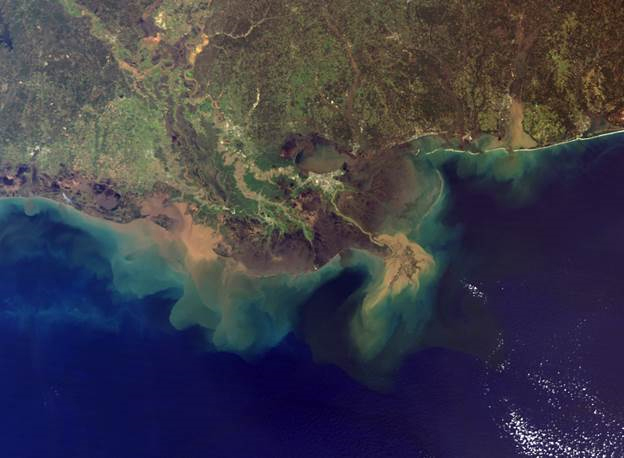 Drowning of the Mississippi Delta due to insufficient sediment supply and global sea-level rise. Nature Geoscience 2: 488-491. Peyronnin, N., R. Caffey, J.H. Cowan Jr., J. Dubravko, A. Kolker, S. Laska, A. McCorquodale, E. Melancon Jr., J.A. Nyman, R. Twilley, J. Visser, J. White and J. Wilkins. 2016. Building Land in Coastal Louisiana: Expert Recommendations for Operating a Successful Sediment Diversion that Balances Ecosystem and Community Needs.